What do you do when you’ve got an award-winning restaurant, but it’s in Zwolle, a hundred kilometers to the east of Amsterdam? How about a place where diners can bunk for the night? The story of Librije’s Hotel is a little more complicated than that, but only a little: long story short, the proprietors of the original De Librije installed their second restaurant, Librije’s Zusje, in a magnificent old 18th-century prison building just around the corner from their first — and with all the space left over, they created Librije’s Hotel. With 19 rooms and suites it might look, numerically speaking, like something relatively modest. But the small size means there’s plenty of attention paid to the details. 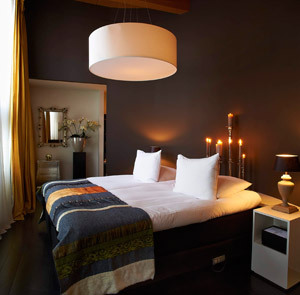 You know we don’t place much stock in the star system, but by any measure, Librije’s is on a level with the Netherlands’ best hotels — and for most of us, all else being equal, the more small-scale and intimate the luxury-hotel experience the better. 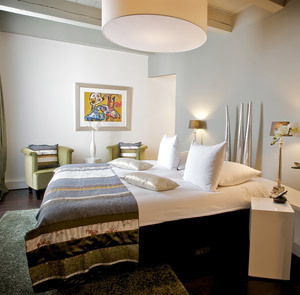 In practical terms this means a room that’s spacious, visually striking, and comes with just about every possible comfort, from integrated iPad systems to outrageously comfortable beds by Auping, the Netherlands’ leading purveyors of somniferousness. Things only get more plush in the junior suites, which add separate sitting areas, and in the suites, which quickly take on a residential aspect. It doesn’t hurt at all that there’s a pair of butlers roaming the halls, seeing to guests’ every whim. And the restaurant situation is about as salutary as a hotel’s restaurant situation can be: between the in-house Librije’s Zusje and the very nearly in-house De Librije are no fewer than three Michelin stars.